Hello everyone! This is Pamela on the Mama Elephant blog using the stamp set Charmed and its coordinating dies. 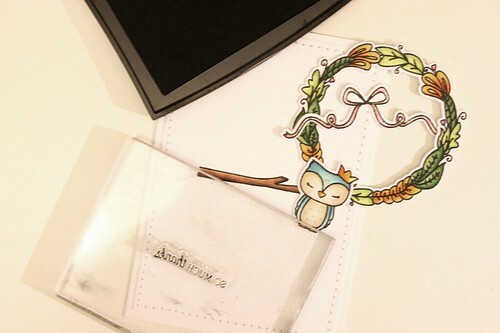 This is an adorable stamp set designed by the talented Elena <3 I started off by stamping the owl (with a little crown! ), the floral wreath and the ribbon from the stamp set. I coloured it with my copics and made some highlights and sparkle using a white gel pen and a clear glitter gel pen. *Tip - I always cut the image out before colouring, just in case I made a mistake in the die-cutting process. This way, I don't have to waste time on recolouring the image! After cutting and colouring everything, I started to assemble my card. I stamped by stamping the tree branch onto a piece of cardstock and stitched it in place. I then adhered the owl, wreath, and ribbon to the card and finished it off with a simple sentiment from the same stamp set. And here you go - a fully assembled card. That owl is super cute!! Here's the close up of the card. You can see the places where I used the white gel pen (for the cheeks) and the glitter gel pen to highlight certain places, like the owl's tummy and the flowers on the wreath. Simply adorable!! 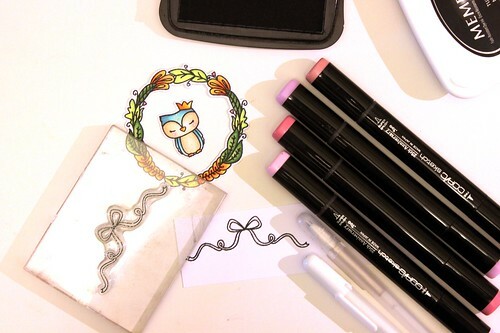 Love the way you colored the little owl! So stinkin' cute! Thanks for sharing. Very nice card. The owl is so cute. 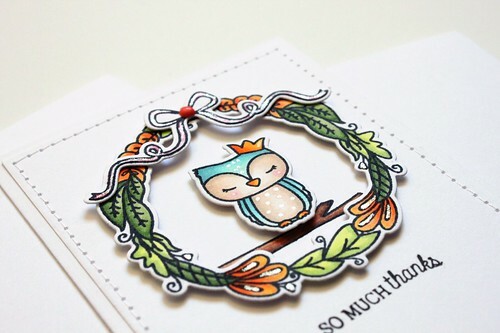 Adorable card, the little owl with her crown just makes me smile!